watch to wear but hard to photograph. 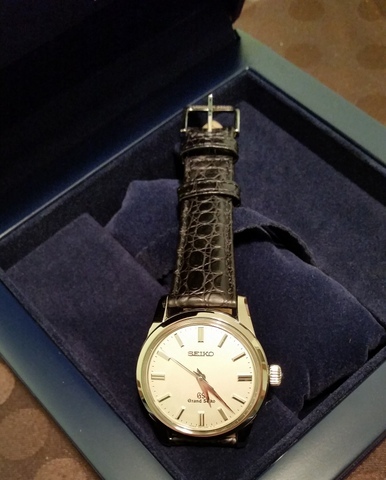 This Eco-Drive watch is also a great accessory if your regular garb tends toward black jeans and shirts. The Black Canvas happens to look terrific if you’re wearing white, too, because it boldly stands out from the rest of your outfit. Black goes with everything, right? The Black Canvas is a medium-size watch, with a case that measures 42 mm in diameter and is 11 mm thick. The black canvas band gives the watch a rugged look. The white day and date display stands out, and I can see the gears in the watch designers’ minds spinning as they try to decide if having anything other than black adds or detracts to the design. I think it works: The white lettering draws in your eyes, which then move to take in the entire watch view. It’s like a small light in a vast dark cavern—a feel and look that works in movies and which is hard to replicate in watches. Speaking of feels, I find the black canvas band a bit too stiff for my taste, but I hope that it will soften over time. Don’t expect to be able to read the time with a quick glance. This is not the watch to wear to a meeting if you want to steal periodic looks at your wrist to see how much time is remaining until you’re set free. The black face, black numbers, and black minute and hour hands give your eyes and brain a little workout, just as you might have to focus your mind to see what’s in that cavern lit only by a small bulb. Ironically, the Eco-Drive Black Canvas is sometimes easier to read in the dark than on a sunny day, thanks to the luminous hands and numbers. The luminosity isn’t that powerful, though—likely a deliberate design decision to keep the hands and numbers from appearing anything but black in daylight. The case is stainless steel; the crystal is mineral glass. It’s water resistant to 100 m, which means that I don’t have to worry about the watch if the weather forecast of sun and blue skies is less than accurate. The Black Canvas was manufactured in 2011. 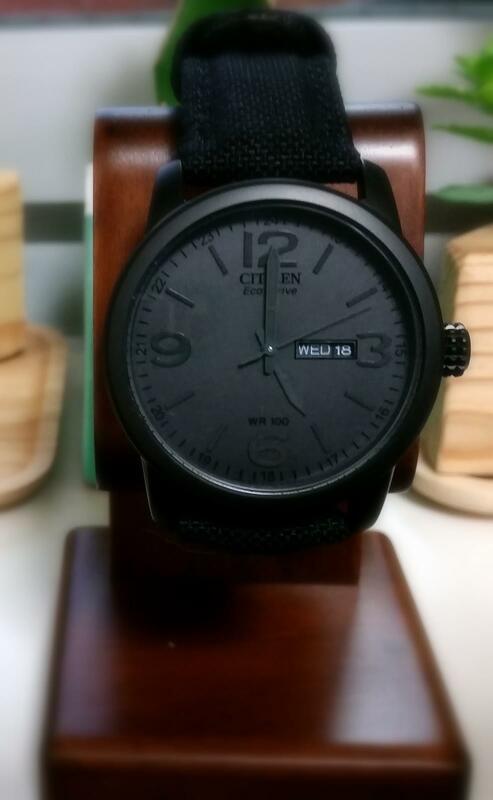 Citizen suggests a retail price of $175, but you can definitely buy it for at least $40 less online. The Eco-Drive Black Canvas isn’t a horological marvel, but it is a lot of fun to wear.